There is rap and hip-hop blaring on the neighboring street of Jalan Sugriwa in Ubud, but this is somehow incongruous with the normal sounds of scooters, horns, gamelan bands, roosters and barking dogs. A group of teenage boys are rocking out while they delicately bend thin stems of bamboo for the frame of the Ogoh-Ogoh monster they are constructing for a raucous exorcism held on the eve of Nyepi, the Balinese New Year and day of silence. The Balinese New Year is the day the island shuts down in quiet meditation, and reflection on the values you want to embrace for the coming year. The streets are silent, the airport is closed and the only people on the roads are the pecalang – the traditional security men on patrol to make sure no-one wanders outside. The silence is also thought to trick the evil spirits into believing the island is deserted so they can take their mischief elsewhere. The week leading up to Nyepi is filled with traditional cleansing rituals in all the homes, villages and temples across the island, but the highlight has to be after sunset on new year’s eve, for this is when the ogoh-ogoh hit the streets. These five to ten foot papier mâché monsters first appeared as part of the festivities in the early 1980’s and depicted figures from the epic Ramayana and Mahabharata tales. The close of the Suharto regime in 1998 ended years of artistic and social suppression so it is little wonder that the monsters paraded today are as likely to depict corrupt politicians, drunks, gamblers and popular comic and film characters as the figures from the epic stories. These enormous monsters symbolize all the evil that must be exorcised before the New Year. Let’s get back to dusk on the eve of Nyepi. Evil spirits are first evicted from the home compounds and as they all tumble into the street they are herded towards the village intersection where large quantities of offerings are piled. Everyone is on the street with flaming torches, the gamelan bands are playing, and the ogoh-ogoh monsters are hoisted high on the shoulders of the village youth as everyone parades around the village and converge on the intersection. Elaborately choreographed fights between the monsters lead to a fiery finale as the ogoh-ogoh go up in flames in the ultimate act of cleansing. 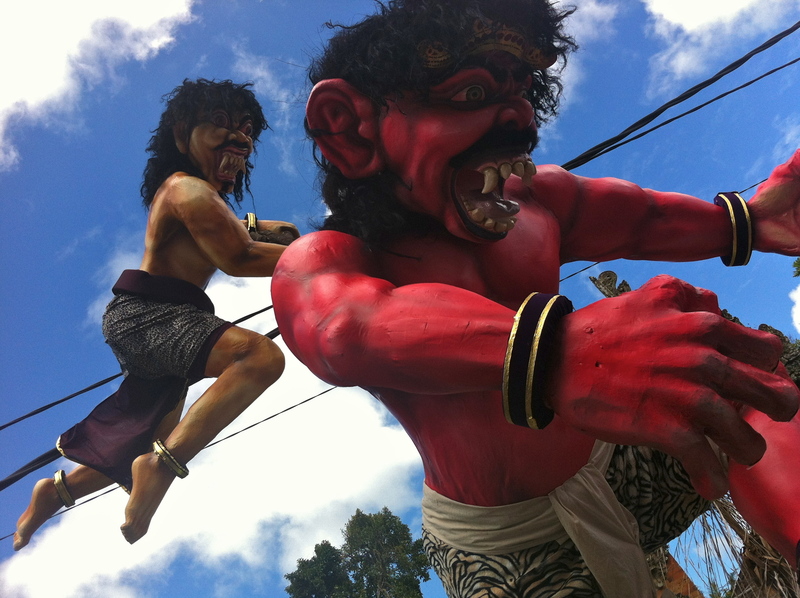 This entry was posted in Bali and tagged Balinese New Year, Day of Silence, exorcism, Mahabharata, monsters, Nyepi, Ogoh-Ogoh, papier mache, pecalang, Ramayan, Ubud. Bookmark the permalink.